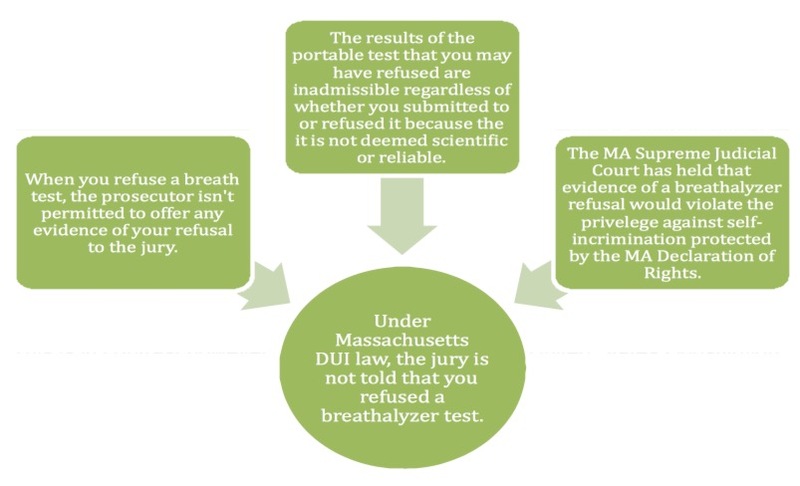 Will a Jury Know I Refused a Breathalyzer Test in a Massachusetts OUI Trial? In the chart below, explains that a refusal to take the breath test, portable breath test or a refusal to perform field sobriety tests, would all be inadmissible at trial. This means a jury is not told, that you refused, took a portable breath test or refused field sobriety tests. This is in contrast however to the interpretation of the United States Constitution where evidence of a refusal to submit to a breathalyzer test can be admitted under federal law. Often a jury will ask whether there was any breathalyzer test even when not presented with any breathalyzer evidence. Under Massachusetts OUI law, the judge instructs the jury that they are only to consider the evidence presented in court. When you refuse a breathalyzer test, the case will depend exclusively on the observations of the officers which includes the observations of the driving, the officers interaction with you at the side of the road, meaning his request for your license and registration and any performance on field sobriety tests. If you refuse field sobriety tests, the jury also is not told that you refused field sobriety tests and that cannot be considered as evidence against you. The reason why a refusal to submit to a field sobriety test or a refusal to take a breathalyzer test is inadmissible is that it would violate your privilege against self-incrimination under Article 12 of the Massachusetts Constitution. The Massachusetts Supreme Court has interpreted the self-incrimination clause of our state constitution to prohibit this evidence in court. It is common to juries to ask whether an individual took a breathalyzer test in a Massachusetts OUI trial. Click here if you are interested in seeing some of Attorney DelSignore’s winning trials. If you have questions about the evidence that will be presented in a Massachusetts OUI trial or about the Court Process when charged with an OUI, you can contact Attorney Delsignore through this website or by calling 508-455-4755 or 781-686-5924.